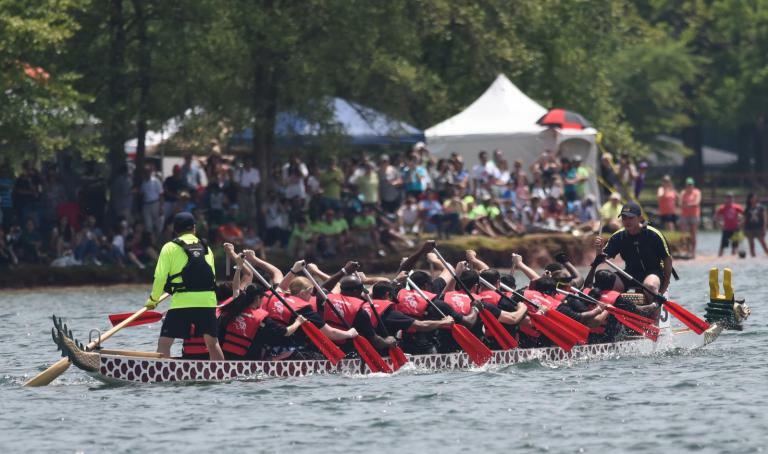 Four significant special events in Lake Norman—the Loch Norman Highland Games, NC Music & Brewers Festival, Asian Festival and Dragon Boat Race and the Warrior Dash—have been added to the Southeast Tourism Society Top 20 list this year. Travel industry leaders select 20 events per month and the Southeast Tourism Society publicizes them throughout the United States. The significance of the nominations is to recognize unique and diverse events, as well as recognize event organizers. This year’s Loch Norman Highland Games, which will be held on April 13-14, was announced as April’s Top 20 Best Festivals and Events in the Southeast. The Loch Norman Highland Games is a modern Scottish festival that features athletic competition, music and dance. This year’s NC Music & Brewers Festival, which will be held on May 10-11, and Asian Festival and Dragon Boat Race on May 18, were also selected as Top 20 events. The NC Music & Brewers Festival celebrates great music and craft brewing traditions. The Asian Festival and Dragon Boat Race brings awareness to the culture, traditions, and history of Asian Americans and Pacific Islanders. This year’s Warrior Dash, which will be held on June 1, is a 5k obstacle course race and festival that welcomes athletes, weekend warriors, and families to the race.